“Listen; there was once a king on his throne anointed with great honour. He sent forth his dove into the world, which dropped the tiniest feather from its wing. The king raised the feather, blew on it, and commanded it to fly. The feather flew, not because of anything in itself, but because the air bore it along. This extraordinarily gifted woman, born c. 1098 in Bermersheim, Germany, was given to the church at the age of eight. The tenth child of Hildebert of Bermersheim and Mechthild of Merxheim, she was promised as a tithe to the church from her birth and was later to become an abbess. She was a polymath: a visionary, a theologian, an early scientist and physician and a prodigious letter-writer who numbered kings, emperors and popes among her correspondents. There is a detailed Wikipedia entry about her HERE. 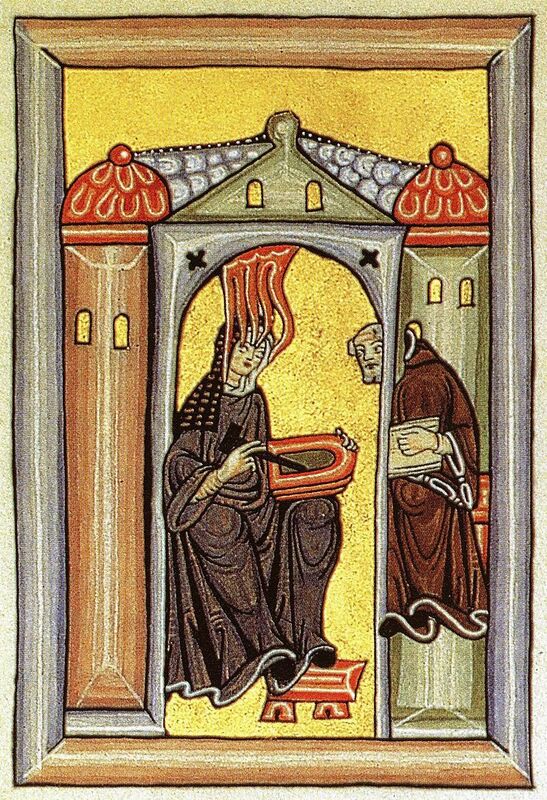 Illumination from the “Liber Scivias” shows Hildegard receiving a vision and dictating to her scribe. This entry was posted in music, spirit and tagged hildegard von bingen, plainsong. Bookmark the permalink.